Tropical Rainfall Measurement Mission (TRMM) Gridded Rainfall Data. Time animation. * The tropics play an important role in the global hydrological cycle, and tropical rainfall is the critical component of this role. Three-fourth of the atmosphere's heat energy derives from the release of latent heat of condensation in the process of precipitation. Two-thirds of the global precipitation occurs in the tropics. * The variability of tropical rainfall affects the lives and economics of more than half of the world's population. * The large spatial and temporal variability of rainfall systems poses a major challenge to estimating global rainfall. TRMM provides systematic, multi-year, visible, infrared, and microwave measurements of rainfall in the tropics as key inputs to weather and climate research. 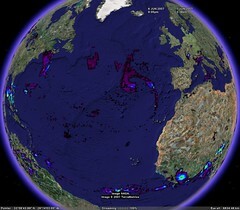 The satellite observations are complemented by ground radar and rain gauge measurements to validate the satellite rain estimation techniques. What Are The TRMM Science Objectives? * To obtain and study multi-year science data sets of tropical and subtropical rainfall measurements. * To understand how interactions between the ocean, air, and land masses produce changes in global rainfall and climate. * To improve modelling of tropical rainfall processes and their influence on global circulation in order to predict rainfall and its variability at various space and time scales. * To test, evaluate, and improve satellite rainfall measurement techniques. The Tropical Rainfall Measuring Mission (TRMM) satellite was launched on November 27, 1997 (EST). Data from TRMM are archived and distributed by the Goddard DAAC and can be accessed from the DAAC's TRMM Data Search and Order Web Interface. Its the great post about the rainfall data,As a Rain Gauges expert I must appreciate your this effort.